Children’s’ books are often lyrical, or funny, or gorgeously illustrated, but not all three. 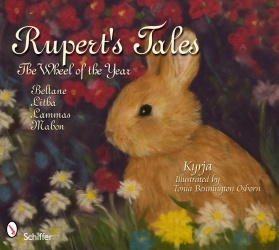 Rupert's Tales: The Wheel of the Year Beltane, Litha, Lammas, and Mabon is the rare exception. This is the story of young Rupert the Rabbit who discovers some very strange people doing some very strange things in the nearby grove. While figuring out what they are up to, he learns about four of the Pagan holidays, and discovers how and why people celebrate them. Rupert’s Tales does an exceptional job of conveying the message and purpose of the ‘bright half’ of the Pagan year to young readers, translating complex ideas into a very simple format. The images are beautiful, and the rhyming catchy and fun. I understand another one is due out soon, presumably covering the ‘dark half’ and I’m sure it will be as wonderful!